Having the day off because of a holy day of obligation definitely has its perks. Besides getting a ton of stuff done during the week when places are open, I found a 12pm mass at nearby St. Colette. All Saints Day is such a great feast day – It’s a reminder of what we are all called to be. And while it’s not easy, we can find little moments of opportunity to be “saint-like” with those we interact with on a daily basis. Enjoy! Initial Thoughts: Got there early enough to snap the photos (above) as well as take a look around. They had photos of their dearly departed parishioners lining the window sills in anticipation of All Souls Day (the following day). There was also a large white banner with the names of all the parishioners who had passed away since last November. I also loved the side chapels (altars? or side chapels? Someone tell me exactly what these are called because I feel like I should know by now). Mass started with the commentator asking everyone to stand and introduce themselves. I’m ridiculously used to this by now and I love it, although if you had asked me that a few years ago I probably wold have rolled my eyes. I was pretty anti-social when it came to mass. Thank God I changed my attitude about that. The only “downside” is that the mass didn’t conclude with the prayer to St. Michael. So I ended up praying it to myself afterwards. It’s really difficult for me to describe a Latin mass. As I attempted to blog about it before (here) words aren’t sufficient. It’s not really the kind of thing to Blog about, to be honest. It’s an experience. I want to make it a point to attend these once a month. So guess what? I found out I have an option for Saturday daily masses if I happen to oversleep (totally did this past weekend). A 12:30pm Mass in Detroit at Old St. Mary’s. I cannot even begin to tell you how thrilled I was to find this out. No more waking up at 7:30am on a Saturday to roll out of bed and get to an 8am mass. I mean, Saturdays were MADE for sleep…didn’t God say that in Genesis somewhere? Homily Reflection: I think I know more about St. Charles than ever thought possible. It was great! Very thorough job by the presider. I couldn’t help but think of all my friends and family who belong to St. Charles at home in Cleveland. So I said a special prayer for them during communion. Fr. mentioned that St. Charles was “totally giving of himself, helping people, exhorting people.” His whole entire mind and heart was dedicated to doing the will of Jesus. He died while tending to people in Milan during an outbreak of a plague. As for the Gospel, St. Charles was also like the good shepherd that Jesus says He is. Like a good shepherd, when the sheep get out of line or wander off, the shepherd is there to get them back in line. Those among us who have no faith in the Lord, non-religious people or non-Christians, these are the people who need to hear the voice of the good shepherd. And St. Charles was a great example of that. We need to do the same if we want to be saints. I feel like I’m turning in a homework assignment two months late just to receive a passing grade. I have zero excuses for not blogging about these masses earlier. Although moving to a different city and getting a new job are two pretty good reasons. Initial Thoughts: I’m the youngest one by far. But that’s also because I’m 20 minutes early and there are a large number of senior citizens filing in. I see the tabernacle is in some corner with stained glass around it. Kind of like an atrium. It’s a little confusing but, hey, at least I can see it. The pipes of the organ are STUNNING. Who looks at the pipe organ pipes and describes them as stunning? I wish I would have gotten a closer picture of them but as you can see from the pics below, they are not your standard silver pipes. I’d love to know more about the design on them if anyone knows. Before mass begins, the commentator recognized the name of everyone involved with the liturgy – the names of the lectors, the servers, the cantor and the EM’s. Homily Reflection: All the homilies are online, so I was able to listen to it again and compare it with my notes. I really liked how Fr. George mentions the humanness of Peter. He’s the only one who answers correctly, “Who do you say that I am?” yet he denies knowing Jesus 3 times. A few lines that stuck out: “Peter wants a Messiah that will conquer the world without getting his hands dirty. His expectations are not in sync with Jesus. Have we ever been there in our failings?” Jesus doesn’t reject Peter and He doesn’t reject us. Holy Moments: My favorite part was the blessing/renewal of vows for Delores and Raymond (Pictured below) of 50 years of marriage. I was tearing up and I have no idea who these people were. It was just so special to witness it. I wore my “Let God Plan Parenthood” t-shirt to this mass. One woman comes up to me and tells me “You are so bold for wearing that, You go girl!” I’m bold for wearing a pro-life shirt to a Catholic Church? Nope, I’m actually a coward for wearing it at Church knowing the chances of encountering someone who disagrees with it won’t confront me. But I was gracious for the compliment. Afterwards, I went around and took pictures of the place and literally walked outside and wondered “What’s that other church-looking building?” Duh, it’s the Chapel. I had this entire chapel all to myself for an hour. You can’t let vacation stop you from receiving Jesus, right? There’s one (literally) Catholic Church on Sanibel Island and this is it. Initial Thoughts: The music minister HAD to be a classically trained pianist. He was playing beautifully as people filed in. Magnificent! A baptismal font in the shape of a shell is something you don’t see everyday but I think it’s so Florida. The outside with the palm trees and the water and the statue of our lady was definitely different. Would be interesting to see if other Florida churches are designed in the same way or if this is just unique to this area. Some historical background: Old St. Patrick is the oldest English-speaking Catholic church in the state of Michigan. Although the parish may have actually begun around 1829, the earliest records refer to its first building. In the spring of 1831 the parishioners erected a log church on a small plot of land where the rectory currently stands. In its more than 175 years of existence, the parish has had 31 pastors, at least two names, and has come under the jurisdiction of three different dioceses: Cincinnati, Detroit, and Lansing. Initial Thoughts: Working in Ann Arbor for a couple months now, I am still amazed at the amount of dirt roads that are in Michigan and especially AA. There’s literally no reason to wash your car, it’s just going to get dirty the next time you drive. What does that have to do with this post? Nothing, I just wanted to mention it. Oh! But actually this church is located off a dirt road. So yes, I did have a point after all. To make things just a tad awkward, the church was in the middle of some renovations so when you enter, you actually enter by going through a door which takes you right to the sanctuary. So for those who are late, the entire congregation sees you. 🙂 I was way early, thank goodness. Holy Moments: They actually use their altar rail and so I received on the tongue at the rail. As I’ve mentioned previously, I love to receive this way. It’s incredibly reverent and humbling. Something I need to be reminded of often. Initial Thoughts: I heard they have renovated the main worship space and wanted to get pictures of it but because it was a daily mass, I couldn’t quite get the best pics (we were in the chapel). But you can see renovation pics on their website. We then sang the Responsorial Psalm which I wasn’t expecting but the cantor/lector had a great voice. However, and this is kind of funny and not meant to be a criticism because this has happened a few times to me as well. But when she sang the Responsorial Psalm for us, she actually left out a couple words (I think O, Lord or something). So we responded back an incorrect reply. But then, after singing the first verses, those of us who were probably following along in the Magnificat or a missal, proceeded to respond back the CORRECT response, completely confusing those who were trying to follow what she initially sang. Then, she must have noticed her error and sang back the correct response but those who were NOT following along were still singing her initial response without the O, Lord. So it’s safe to say, all 4 responses were totally different, ha! It’s all good though, God was being praised, I’m sure He didn’t mind. 1. Don’t run from God. 2. You can’t even if you try! 3. It’s never too late to call on the Lord’s mercy. Not-So-Holy-Moments: As much as I loved all the singing, I had to leave after communion, which I don’t think I’ve done in years. I feel like the bad Catholic if I ever do. But I couldn’t be late for my appointment. The entire mass took a good 50 minutes, and we should never be in a rush to receive Eucharist but unfortunately, I found myself a little distracted because I could sense it was running late. There was another distraction and this one is actually becoming quite common and probably something that should be addressed by…someone. Talking during mass. But no, not talking to your neighbor, or your kids. No, I mean talking out loud during the Eucharistic Prayer. Speaking the actual words that the Priest (and ONLY the Priest) is supposed to say. The woman next to me, God Bless her, was whispering loud enough for me to hear, most, if not all, of the Eucharistic prayer. This is something only the priest says. He has his part, we have our part. But apparently that was not what this woman learned and I, being the easily distracted creature I am, could not focus. A peek into my mind at the time: “Oh no no no no. NO PLEASE STOP PLEASE STOP PLEASE STOP WHISPERING THE PRAYER. Okay maybe she was just whispering the preface. I’m sure she won’t whisper the prayer, I mean how can she possibly know which one he’s going to use, and oh yeah she’s saying it all, every single word. But not the prayer of consecration, Please lord tell her not to whisper the consecration and OH DEAR LORD SHE JUST SAID DO THIS IN MEMORY OF ME…I’m going to lose it. I’m going to lose it and I’m trying to be a good Christian here, I’m really trying, I need to be charitable in my thoughts and actions but GOD SHE’S DISTRACTING ME! I should say something to her. Right? If I was doing something wrong I’d want someone to tell me. But when? How? Should I say something at the sign of peace? How would that go? Peace be with you and please stop whispering loudly you’re very distracting and I’m losing my mind. Peace be with you and your tongue, can you maybe take it down a notch? Needless to say, because I had to leave early, I didn’t get a chance to say anything. And honestly, I am not the type to do so. I am gutless when it comes to correcting people, especially total strangers. I simply prayed that someone will eventually inform her about the mass, about the role of the congregation and the priest, simply so she can understand and appreciate our parts more fully. In two weeks I’ll be going on a Church Tour through the Archdiocese of Detroit to see Sweetest Heart of Mary, Sacred Heat Major Seminary, St. Joseph Oratory, and Old St. Mary’s in Greektown. The tour ends with a Vigil Mass with Archbishop Vigneron at Sweetest Heart of Mary. I’m SUPER excited about this and cannot wait to blog and share pictures of this most blessed event. I was all over the place this past week, attending mass in Berea, Brunswick and Norton. Homily Reflection: I heard three distinct messages from Father’s homily: “Get outside your own head during Lent.” Ask yourself “Are you looking out for yourself or others?” And lastly, “We need to be the selfless servants that God calls all of us to be.” How much of what I do this Lent is about ME and how much of it is about serving others? Is HE at the center of my life? Or am I making this all about ME and MY issues, MY fasting, MY prayer life and no one else? Holy Moments: I’m so glad to hear the prayer of St. Michael recited at the end of mass. This is a tradition that not many churches do today. And it’s really a shame because we are in a spiritual battle. And we absolutely need to call on St. Michael to defend us. Ran into some friends after mass that I just love. Another great community there in Berea. Fr. Barry is a fellow Theology of the Body teacher so I’m very grateful the students at the Academy of St. Adalbert are receiving this crucial teaching. Celebrant: Fr. William Krizner, my high school chaplain! Homily Reflection: Jesus predicts what is going to happen in today’s Gospel: He tells us he will be raised on the 3rd day. The all important feast we celebrate NOW, at this moment in mass, is the Resurrection. Come Holy Week, we remember Jesus’ passion, death and burial. But right now, actually, we remember and celebrate His resurrection. His homily reminded me of Bishop Robert Barron and one of his video’s about Easter. He says: “We are an Easter people.” If we don’t believe in the Resurrection we’re basically saying that Jesus was just a prophet. This is why we profess in the creed, “I believe in the resurrection of the body.” What is Christianity without Easter? I picture us celebrating Christmas and then…nothing. We’d be talking about this guy who lived 2,000 years ago, who was crucified, died and was buried. And that would be the end of the story! And not a very good one. I did introduce myself to Fr. Krizner after mass telling him he wouldn’t remember me from (gulp!) 20 years ago. He was as friendly and kind as I remember. I wasn’t involved in my high school ministry at all. I don’t really remember too much about religion in high school either. I remember bits and pieces of what we learned but unfortunately, I just didn’t pay attention as a teenager to that sort of thing. Completely opposite of how I am now, clearly. I didn’t get too much time to chat with Fr. so I am going to have to make it a point to go back again for another mass. Holy Moment: After communion there was a longer than usual break before the closing prayer. Usually daily masses seem to be sped up because clearly they are shorter. During this mass, it felt like time stood still. And it was completely silent even though there were easily 30 of us there. And then I noticed an incredible sense of peace in my heart. I was completely content. I just contemplated what communion is: Receiving the body and blood, soul and divinity of Christ. Even someone with the tiniest amount of faith has to admit that that’s incredible and beautiful. And I just sat there in awe. Moments like that, I wish everyone was Catholic. I’m incredibly fortunate to be able to have the flexibility and the freedom to do this project. I just wish I could take everyone I know with me…literally, like pack everyone I know into my little Honda and bring them to every mass I go, so they too can meet all these interesting people in the pews, and hear the homilies and see the beauty of our rituals and the sacraments. And that shouldn’t be surprising. After all, we experience heaven on earth when we’re at mass. Why wouldn’t I want to bring everyone with me to heaven? Next week: Sunday mass at St. Thomas the Apostle in Sheffield Lake, an Adoration experiences in Wadsworth and Lorain unlike any other and daily masses in Avon Lake and Elyria. Phew! This week: St. Gabriel in Mentor, St. Joe’s in Strongsville, and St. Clare in Lyndhurst. No this is not a picture from the mass I attended but I wanted readers to see the altar and beautiful cross/design they have here. Number of Attendees for a 5pm Sunday mass: Outstanding! Immediately I feel like this parish is incredibly welcoming. Maybe it just appears to be larger than it is but all I know is I have never seen a 5pm mass on a Sunday so packed! It was awesome to witness. Everyone seemed pretty joyful and happy to be there. As soon as I sat down I noticed the choir was made up of a variety of people as well as a few young girls who happily announced where we could find the songs in the hymnal. I didn’t even care that the little girl pronounced Epiphany as “Effany.” Adorable! Homily Reflection: Fr. Denk has his own website, The Prodigal Father, and he puts his homilies online. So I can “cheat” on this one and copy and paste my favorite part, which was this: Have you had some kind of experience in your life that makes you want to yearn for more? If you have, are you still seeking? Are you still seeking with all of your heart? Because, ultimately, if we are not thrill seekers or Christ seekers, we are going to lead very boring monotonous lives. If we are Christ seekers, we are going to discover the more and more we experience Him, the more and more we are going to long for Him. If I’m not a Christ-seeker, I sure don’t know what the heck I am! Because I think even a blind person could see that I’m seeking Christ everyday. And my life ain’t boring, that’s for sure. It’s truly amazing and I do wish everyone had this longing to seek Him out. Holy Moments: I recognized one of the Eucharistic Ministers as a young man who was on the team for a TEC Retreat I made exactly a year ago. Totally random and a complete God-incidence. Also, after every 5pm mass on Sundays, St. Gabriel has Eucharistic Adoration for an hour and 45 minutes followed by Night Prayer and Benediction. It became obvious not everyone knew this was happening, either because they didn’t read the bulletin or just never come to this particular mass. So you could see some confused looks on people’s faces. I am a relative newbie to Adoration (just about a year steady) so I’m happy to see parishes making a point to do this after mass/weekly for people to have some alone time with Jesus. Our Father Orans Posture: I saw MANY Orans poses and MANY people holding hands. Looks like I’m in the minority once again as a “hands folded” poser. I LOVE chapel masses! It makes me think of when my Mom took me to daily mass as a toddler at St. Anthony’s in Parma, before they built the church that is there now. But it’s also nice to be in a small setting with just a couple dozen people. Homily Reflection: Deacon Robert had the homily and mentioned there are actually 3 Epiphanies: The Epiphany Feast on Sunday of the Magi, the Baptism of the Lord that we celebrate today, and the third is Jesus’ first miracle of changing the water into wine at the Wedding at Cana. He also mentioned to use not just our words but our actions; that our actions are what matter most in trying to build up the kingdom of God. And that how we act is of paramount importance as Christians. Holy Moments: There was a program for this mass! That’s always a nice touch. But then I realized they chant/sing the Entrance and Communion Antiphons. A very nice added touch, because usually, we just speak these, we don’t sing them. But these folks did a great job. Their chapel also serves as a perpetual adoration chapel, so I went there first for some adoring time beforehand. At 6pm people started to file in and before I knew it, I was praying a rosary with them! A pleasant surprise. What’s better than a Chapel Mass? A School Mass! I pull in to the parking lot with 5 minutes to spare but little did I know they began this mass about 5 minutes early, so I walked in to a bunch of kids singing “Glory and Praise to Our God.” I’m telling ya, if you need a pick-me-up, go find a school mass. The kids will just melt your heart. These kids, from Corpus Christi Academy, were on such great behavior. And the girls in the choir singing perfectly in tune, especially this adorable blondie enunciating every word. She was very dynamic and quite the singer. Homily Reflection: The gospel included the line about Jesus going off by himself to pray. So the priest emphasized a prayer life with the children. But he also mentioned how priests pray the Liturgy of the Hours. I have been praying the LOH consistently for about 3 months now and it is awesome and wonderful and literally sets the tone for my day. It’s best to start your day with prayer than by checking your phone to go on social media, check email, or text someone. That stuff can wait! 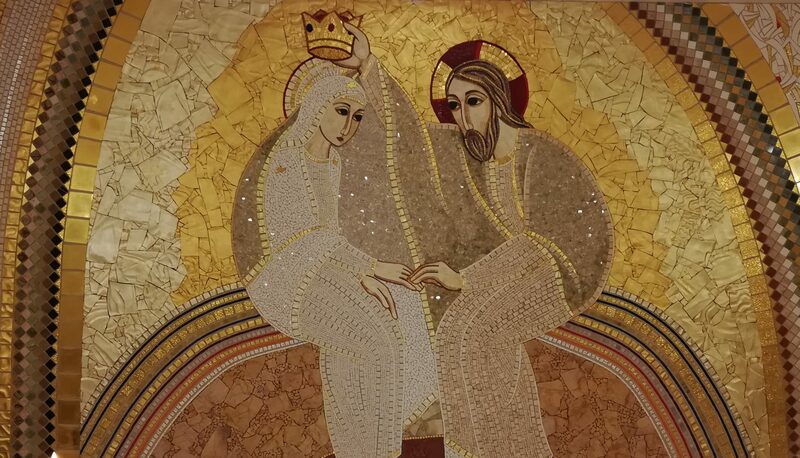 Holy Moments: I stayed in the church after mass and as the children were exiting, I made my way over to a kneeler in front of statues of the Blessed Mother and Joseph. All of a sudden the kids who were leaving the church became completely quiet. I think their teacher must have pointed to me as if to say “She’s praying, be quiet,” because I could hear a pin drop. I came to find out after I started to write this blog, that they have a chapel with adoration next door. Duh! I didn’t even bother to ask. Definitely could have used some quiet time but all in all it was a great mass and a great start to the day. Up Next: Heading all the way out to Medina – An early Saturday morning mass at St. Francis Xavier, a weekday mass in the chapel at Holy Martyrs, and a Sunday mass at beautiful and historic St. Martin of Tours in Valley City.